Hey Everybody! 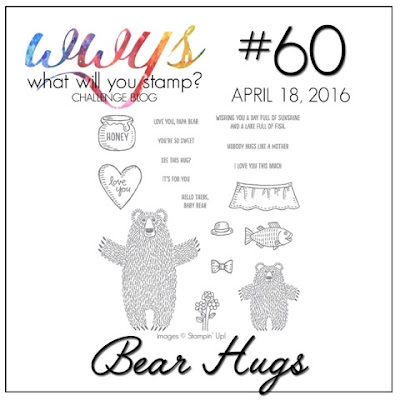 Welcome to week #60 of What Will You Stamp! 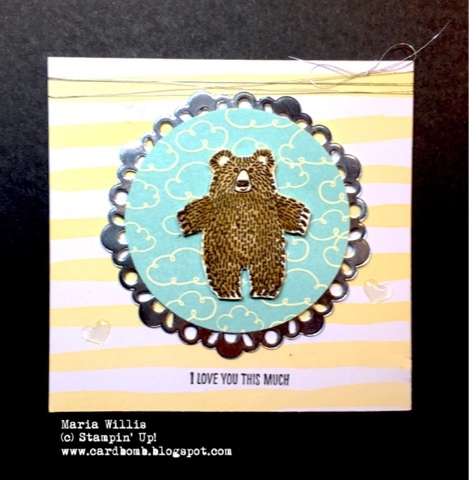 This week our challenge is Bear Hugs and I used the adorable little cub from the set to make this simple card. Here's a close up of the little bear. I heat embossed him in Early Espresso and watercolored him in with chocolate chip ink using my Aqua Painter. I cut him out by hand because I don't have the framelits that match this set (boo hoo!). It's ok, he was actually pretty easy to cut out. I layered him on some Sweet Lil Things DSP and again onto a silver doily. I topped the card off with silver metallic thread and some Itty Bitty Accents Epoxy sticker hearts. In case you haven't checked out this whole set, here ya go! It's pretty fun but my favorite stamp in the whole set really is the adorable little bear cub. He just looks like he wants to give someone a hug so badly! I love hugs! I'll take it little bear! Thanks for stopping by today! 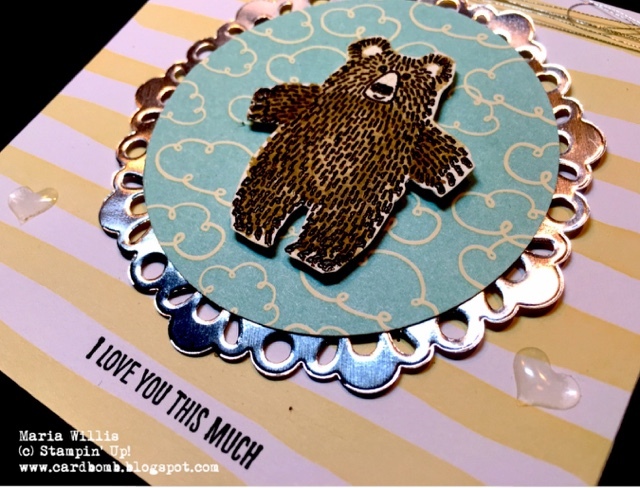 If you want to see more incredible cards made with this set please hop on over to the What Will You Stamp Challenge Blog and see what the rest of the team has made. If you have a great idea of your own please post it to our page this week-We can't wait to see What You Will Stamp! Need to do a little shopping today?